Please take some time to read this lengthy, but great article by Dr. Hancock UGA Extension Forage Specialist on nitrogen fertilization in our pastures and hayfields. Yet again, the weather is making farming a high stakes game of chance. We had a very wet end to the summer growing season (in most areas) and this resulted in the leaching out of almost all of the residual N in the soil. Then, we’ve had lots of warm weather lately, and this has encouraged disease issues to severely limit the growth potential of winter forages. The warm weather has also allowed for some additional N mineralization to occur, but this N hasn’t stuck around long enough to provide N to our winter forages. That is because we’ve had quite a bit of rainfall in the past several weeks (pretty much the whole state) and what little available N was released has quickly been leached away. Many (if not most) of our winter forage crops are starving for N at the moment. Even fields with good stands of clover are suffering because these legumes aren’t yet fixing much N (because the soils have been so water-logged that they can’t fix N). To make matters worse, the weather projections are not particularly positive. The models suggest a lot more of the same on the near-term: mild to cool temperatures and above normal rainfall through March-April. They also project a short end of spring: above normal temps fairly normal rainfall in late April – June. This means that the remaining bit of the production season is likely to be compressed from what is normally a February – May growing season in a good year to what may be just March – April in some areas. Standard soil test recommendations are that one should put out 50 lbs. of N/acre on ryegrass and small grains in late winter (late January – February) and another 50 lbs. of N/acre on ryegrass in early spring (mid-March – mid-April). Applications of N at these rates are likely to result in more than 15-20 lbs. of DM per lb. of added N for the late winter application and more than 20-25 lbs. of DM per lb. of added N. As a general rule of thumb, N response rates greater than 15-20 lbs. of DM per lb. of added N will result in an economical response. This year, timely action with the winter applications will be absolutely crucial. Even if adequate N was applied at planting, it is likely that little or none of that is still available at the time of this writing. Scenario 1) Ryegrass or small grains that have been slow to grow, either because of bad weather or N deficiency (and, sometimes, a late planting). These winter annual forage crops will often respond very aggressively to a winter application (20-30 lbs. of DM per lb. of added N assuming N rates are 40 – 60+ lbs. of N/acre). It is analogous to compensatory gains in growing livestock. It is the same basic principle: an organism that has had growth limitations will often grow at extraordinary rates whenever those factors are no longer limiting. Scenario 2) Ryegrass or small grain plantings that have been growing strong. Winter annual forage crops in this scenario are unlikely to respond as aggressively to N at this time. For example, they may barely provide 15 lbs. of DM per lb. of added N during the few weeks following N application. However, this N is still crucial, as it keeps the plant growing at least at a healthy rate. Therefore, it is important to fertilize them at the same or nearly the same rates because they will need the fertility during the remainder of the season. Scenario 3) Winter annual forages that have been moderate to severely damaged by disease (Helminthosporium leaf spot, grey leaf spot/blast, leaf rust, or barley yellow dwarf virus, etc.). These forage crops are unlikely to respond to N application. For example, tillers that are exhibiting physical symptoms of barley yellow dwarf (BYD) infection will die quickly, especially following a hard freeze. Therefore, if more than 30% of the tillers in a stand of oats have been damaged by barley yellow dwarf; those plants are unlikely to respond well to N. Each producer will have to determine if they are willing to take the risk, but if it were my oats, I doubt I would put any more N into those areas/fields. Another consideration is the growth cycle of the crop. Here again, oats provide us a good example. Oats generally grow very well in the fall and in the spring, but not very well in the winter. The N recommendations for small grains as winter grazing states “…these crops can utilize about 100 (lbs. of N) per acre during the growing season. Split the (N) application, applying 50 (lbs. of N) per acre at planting and 50 (lbs. of N) per acre in late winter before spring growth begins.” The instruction to apply 50 lbs. of N/acre in late winter for small grains applies to oats, as well as to rye, wheat, and triticale. However, the operative part of this recommendation is the final phrase “in late winter before spring growth begins.” The spring growth of rye, wheat, and triticale has already begun or will do so imminently. The spring growth of oats really won’t begin until early March. Therefore, one would be wise to delay the late winter application of N to oats until the end of February. Many of the N products that are most readily available are based on urea. Urea and urea-based N formulations are, chemically speaking, organic forms of N. Urea must be broken down via a biological process to form nitrate, which is the form of N that plants predominantly absorb. Because this process is dependent upon the activity of microorganisms in the soil, weather can affect how rapidly this N becomes available to the plant. Cool and wet weather slows down the conversion of urea to a form of N that is available to the plant. Many producers will put on a significant amount of urea only to find that their crop fails to green up. This is NOT because they received “bad fertilizer.” It may be the result of the cool, wet weather. Poultry litter is a great source of N… in the summer months. But, in the winter months, it is marginal at best. The reason for the difference is that most of the N is in an organic form. Just like the urea, the N in poultry litter has to be broken down by biological activity (bacteria) in order for it to be made available to the plant. Further, putting poultry litter out now (February) is likely to pose an environmental risk such as the contamination of runoff water and therefore contaminating the water in your ponds, streams, and other freshwater resources. Of course, that assumes that poultry litter is even available to put out now or that one could get one of those trucks in the field at present, given how wet the soil is at present. 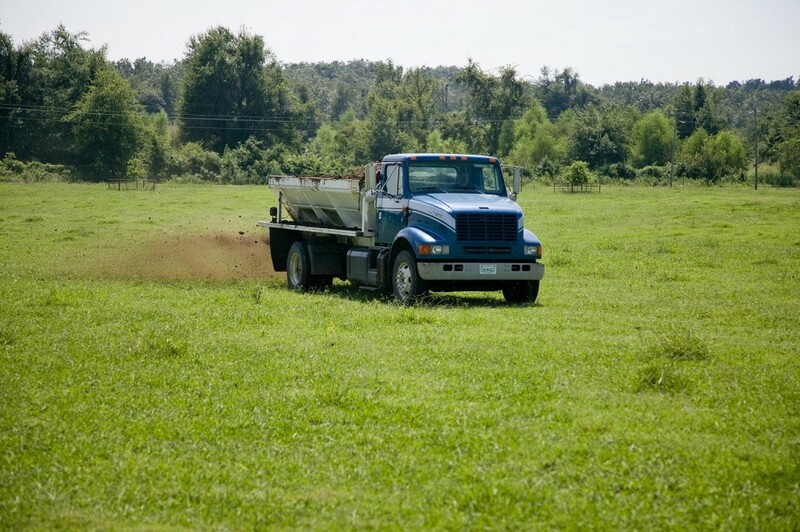 Many producers apply poultry litter in the fall whenever they plant their winter grazing. This gives it a little bit of N to get off to a good start. But, it doesn’t provide much during the winter. There are three reasonably good alternatives to these aforementioned N sources. The first one to be considered is liquid N (UAN), which is approximately half urea and half ammonium nitrate. Because of the ammonium nitrate portion, it is more readily available to the plant than many other N sources. One should also consider using either Agrotain Plus-treated urea or SuperU. Both of these products are urea-based, but are sold under different trade names. Both are treated with a urease inhibitor (N-butyl-thiophosphoric triamide), which prevents loss as ammonia, and a nitrification inhibitor (dicyandiamide), which prevents N loss to leaching. These still have the challenge of urea’s slow release, but they are less likely to be lost to the environment as ammonia gas or nitrate leaching into the groundwater. Last, but certainly not least, one should consider using the 18%N 19E product, which is a liquid N product sold by the R.W. Griffin Feed, Seed & Fertilizer company and its distributors. This product is essentially liquid calcium ammonium nitrate with sulfur and a few other micronutrients. The N from this product, like ammonium nitrate, is almost immediately available to the plant. Further, it is often quite economical compared to other N sources because it is locally produced. Previous: Pecan Meeting! Wednesday Feb 3rd 12:00!! Next: Row Crop Fertility Meeting! Thursday Feb 4th! !